In 2000, people worldwide cast 100 million votes to choose the “New Seven Wonders of the World”: Rome’s Colosseum, India’s Taj Mahal, the Great Wall of China, Jordan’s ancient city of Petra, the Inca ruins of Peru’s Machu Picchu, Rio de Janeiro’s Christ the Redeemer statue and ancient Mexico’s Mayan city of Chichén Itzá. Unfortunately, most of us can’t visit these faraway places. We need a close-to-home version, a list of wonders here in the good old U.S. of A that are so breathtaking and so quirky, they invariably make visitors reach for their Primatene Mist. Here you have it: The Seven Wonders of the Fishing World. When you mention the Fresh Water Fishing Hall of Fame to someone, they typically think of a record-keeping operation. This must be where those world records for all the different fish species are kept. They’re partially right. The Hall of Fame does maintain a record book of both world-record fish, as well as line-class records for all the freshwater species in North America. But there is more. 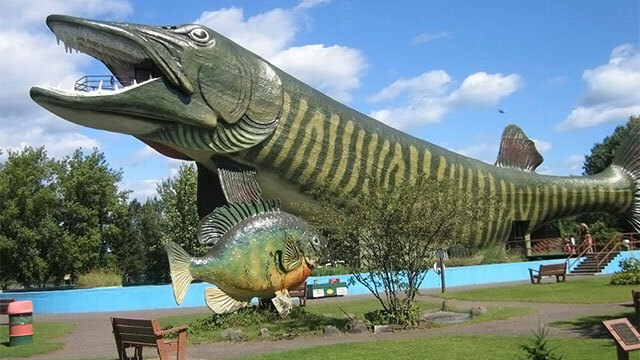 At the museum complex at 10360 Hall of Fame Drive in Hayward, Wisconsin, more than 50,000 people each year come to see the landmark “Shrine to Anglers,” a concrete, steel and fiberglass building shaped into the likeness of a leaping muskellunge that’s half a city block long and four and one-half stories tall. The massive fish’s gaping open jaws accommodate about 20 people as an observation platform, with a panoramic view of Lake Hayward and the surrounding city. Inside the adjacent four-building museum complex, visitors can see incredible displays of fishing artifacts, including more than 50,000 vintage lures, rods, reels and angling accessories. Additionally there are about 300 mounted freshwater fish and 1,000 vintage outboard motors, including Evinrude’s first production outboard from 1909. There’s also an extensive research library and information about the many fishing greats inducted into the Hall of Fame since its founding. Some folks like to leave their Christmas lights up year-round. Perhaps that was the inspiration for Clarksville, Virginia’s Hydro Glow Bridge, a fluorescent tribute to Southern ingenuity. Clarksville officials wanted the Highway 58 Bypass bridge across Buggs Island Lake to serve as the city’s gateway, and someone came up with the idea of lighting it to accomplish that end. Light it they did, but in a most unusual way. Each bridge pier has four green Hydro Glow fishing lights on it—two underwater and two above—76 in all. When the lights were turned on in 2006, the city not only had a unique gateway, it had created a one-of-a-kind nightfishing attraction. The lights attract baitfish, which in turn attract largemouths, crappie, catfish and other gamefish. The gamefish attract anglers who are pumping millions of dollars into the local economy. Texas is big, and it’s full of big stuff. Among the many giant things you’ll find in the Lone Star State are the world’s biggest six-shooter, the world’s largest wooden nickel, the world’s largest fire hydrant and the world’s biggest rattlesnake. On June 12, 1999, avid fly fisherman and retiree Tiney Mitchell of Port Isabel, Texas, and a committee at the Laguna Madre Fly Fishing Association finished building the world’s largest fly fishing rod and reel. Recognized as a Guinness World’s Record, the fiberglass rod is a whopping 71 feet, 4-1/2 inches long with a working reel 4 feet in diameter and 10 inches wide. Casting the huge rod and reel would require the combined strength of two dozen strong men or one big Texan, according to the sign in front of the fly rod. The original Sunshine Skyway Bridge over Florida’s Tampa Bay (connecting St. Petersburg with Sarasota) opened to the public in 1954. In 1969, a similar structure was built parallel to it to make it a four-lane bridge. From 1954 to 1980, thousands of large ships and boats passed underneath the bridge without incident. Then, during a violent thunderstorm on May 9, 1980, a tragedy occurred. The freighter Summit Venture collided with one of the bridge's western columns, causing 1,200 feet of bridge to collapse and killing 35 people. In 1987, a new Sunshine Skyway Bridge was constructed. Rather than removing all of the bridge, the remaining structures were renovated to create fishing piers, and, in 1994, they became Skyway Fishing Pier State Park. The South Fishing Pier, 8,400 feet long, is the world’s longest fishing pier and has parking for 571 vehicles. The North Fishing Pier (3,360 feet) has parking for over 200 vehicles. The piers are so long you can literally walk to offshore fishing for deep-water species. Common catches include grouper, king mackerel, snook, tarpon, sea bass, Spanish mackerel, cobia, sheepshead, red snapper and pompano. A man landed a 1,200-pound shark there a few years ago, the stuff of which legends are made. A one-day annual event might not seem like something you’d include on a list of the 7 Wonders of the Fishing World, but at the Ice Fishing Extravaganza put on each January by the Jaycees in the central Minnesota town of Brainerd, you can see more than 12,000 ice fishermen on a single bay all drop their fishing lines into the water at once—a sight that qualifies this charity event for honors on our list. At noon, a cannon goes off and fishing begins in the 20,000-plus holes organizers have pre-drilled into well-frozen Gull Lake. The biggest fish win part of $150,000 worth of prizes, including trucks, ATVs, generators, ice augers, gift cards, cash and more. Almost as soon as the cannon sounds, people start running to the center camp with fish to be weighed by the officials. Within two to three minutes, the line will stretch 150 yards long. It stays that way for until 3 p.m. when the contest ends. 2015 was the 25th anniversary of the extravaganza. Proceeds go to more than 40 charities in the Brainerd lakes area, with more than $3 million raised to date. The massive Pyramid on the bank of the Mississippi River in downtown Memphis, Tenn. was built as a sports arena in 1991, and once hosted the Memphis Grizzlies. The NBA team moved in 2004, however, and the world’s sixth-largest pyramid sat empty for years, a white elephant that caused much local consternation. Legend has it that Bass Pro Shops owner Johnny Morris was fishing on the river near the Pyramid one day with local angler and fishing legend Bill Dance, and the two of them discussed renovating the landmark and turning it into a Bass Pro retail store. Morris told Dance if they caught a 30-pound or heavier catfish that day, he would commit his resources to the project. They caught a 34-pounder, and the rest, as they say, is history. The 534,000-square-foot facility opened in April 2015, and in its first month, half a million people visited. It’s not just for anglers, of course, but everyone who loves fishing will find it a place of dreams. In the store, you can buy every type of fishing gear that’s made, from hooks to boats. But the Pyramid is much more than a store. The basketball court was replaced with 600,000 gallons of water features containing more than 1,800 fish. The “swamp,” with its 100-foot-tall cypress trees, is spanned by footbridges and features a floating selection of fishing boats families can scramble in and out of. There’s a wilderness hotel called Big Cypress Lodge; Uncle Buck’s Fishbowl and Grill, a nautical-themed restaurant and bar with a saltwater aquarium; and a 13-lane ocean-themed bowling alley. Many visitors come just for The Lookout, a breathtaking, glass-floored observation deck at the top of the 32-story Pyramid, with breathtaking views of the Mississippi River, Mud Island and downtown Memphis.